Our Mission is to transform our communities through inspired action and education, which builds leadership and local self-reliance. We love keeping track of our impact. Here are just a few of the “stats” we have been keeping over the years. Square Feet of Lawn Gone! In 1996, Daily Acts founder Trathen Heckman quit his job at a Fortune 500 consulting firm to follow his passion for snowboarding. After several years of snow, travel and becoming more aware of the huge environmental and social issues our world faces, Trathen discovered Bioneers, a whole community of deeply inspired and activated people and leaders. Soon after, he stepped into Penny Livingston’s backyard at the Permaculture Institute of Northern California and was astounded to witness how a water-wasting lawn had been transformed into a fecund forest of food, medicine and wonder. These two experiences had a profound effect on Trathen and motivated him to actively seek out other concerned people purposefully engaged in living their inspiration while regenerating nature and community. Then, just as he was getting filled up on hopeful visions of inspiring people and transformed landscapes, in 2001 the tragedy of 911 struck. Adding deep personal hurt to this incredible national loss, a month later he suddenly lost his mother. Having been exposed to inspiring people and solutions helped Trathen to turn the grief, frustration and overwhelm from both his personal loss and the hurt he saw in our world into an uplifting and transformational experience. 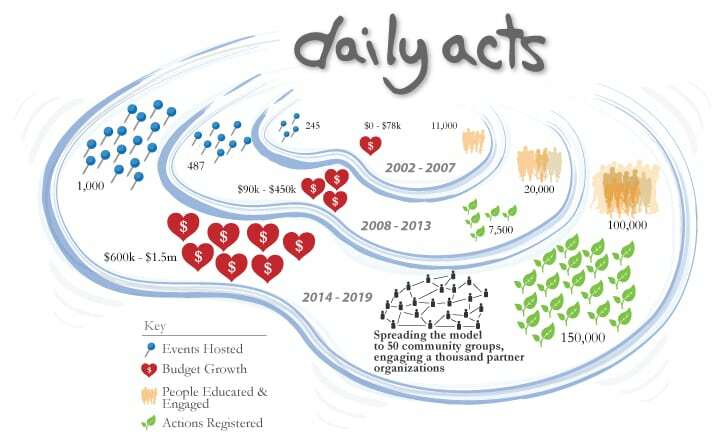 Daily Acts was born in 2002 and is founded on the belief that by reclaiming the power of our daily actions, we can transform our lives, our homes, gardens and neighborhoods and that through inspired action, education and collaboration, we can create more nourishing, connected and resilient communities. We can be the change we wish to see in the world, and it starts with each one of us. 2010 – 1st ‘350 Garden Challenge’: 628 Gardens planted and/or revitalized! 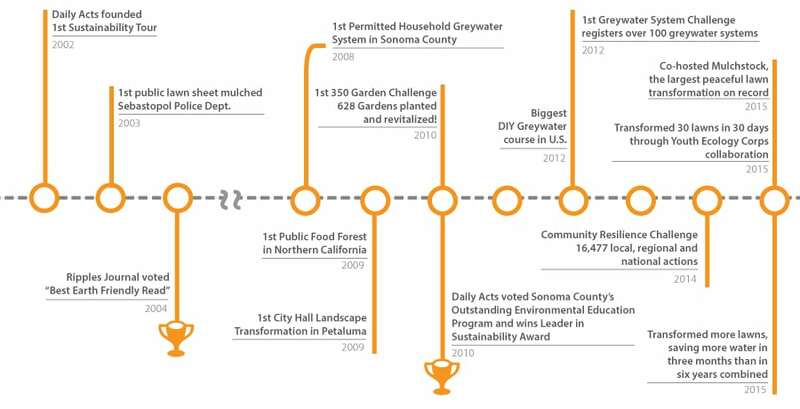 Over the next five years, Daily Acts’ will continue to build community resilience and local self-reliance in Sonoma County by inspiring concerned and engaged citizens and leaders to conserve resources, while modeling practical sustainability solutions, personal leadership and a reverence for life. Daily Acts will also provide targeted training and movement support for sustainability, permaculture and civic groups in the Bay Area and national Transition Network through spreading the Community Resilience Challenge, replicable program models, and leadership development. By collaborating with 50 community groups we will inspire 150,000 resilience-building actions, support the implementation of 1000 programs while engaging 1000 partner organizations. Providing the awareness, education and skills to motivate the greatest number of concerned and engaged citizens and leaders to be the change and take significant action. Creating, strengthening and sharing home, civic, business and school models which reduce water and energy use and waste by 60 – 80% while building soil, recycling rain and greywater and increasing the diversity of edible and multi-beneficial plants and animals. Deepening our impact in the cities of Petaluma, Cotati and Windsor and expanding programing to additional North Bay communities. Increasing community access to these solutions particularly for underserved youth and communities and schools by educating and or partnering with organizations who serve this demographic). Strengthening, celebrating and growing our homegrown groups and networks. Improving and replicating our programmatic models which create more engaged citizens and leaders while spreading home and civic models and civic policies that support these programs. Collaborating with government, business, community organizations, schools and faith-based groups. Providing sustainability programs while at the same time supporting civic policies that increase access and effectiveness of resource conservation programs (advocate and serve). Increasing our positive impact and the capacity of our people and organization every year. Modeling and nurturing homegrown and self-care practices within the organization and beyond.